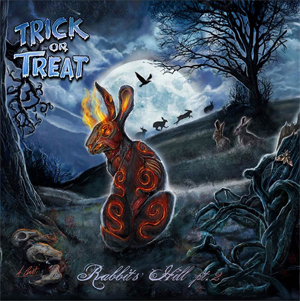 Frontiers Music Srl is is pleased to announce the release of TRICK OR TREAT's new album Rabbit's Hill Pt. 2 on July 8th! Originally formed in 2002 as a HELLOWEEN tribute band, TRICK OR TREAT soon became a popular live attraction in their home country of Italy. After recording their first demo of original material, they were signed by an independent Italian label, Valery Records. In 2006 they released their first full-length album, entitled Evil Needs Candy Too. The band then spent the following two years on the road playing over 100 gigs in Europe and the USA. The band released their second album, Tin Soldiers in 2009. Three years later, 2012 proved to be an important year for TRICK OR TREAT, firstly because singer Alessandro Conti was chosen by LUCA TURILLI'S RHAPSODY to be the lead singer on the album Ascending To Infinity and secondly, the band released their concept album Rabbit's Hill Pt.1", based on Richard Adams' novel Watership Down. Four years on, the second chapter, Rabbit's Hill Pt. 2 is now finally finished and comes with the news of the band signing a worldwide, multi-album deal with Frontiers Music Srl. The recording sessions for the new album have been the longest the band has ever taken part in and the work with producer Simone Mularoni (DGM) captured all the intricate details of their take on power metal. For this album, the band added huge orchestrations and epic choirs mixed to their usual signature power metal sound, in order to sonically reflect all the epic adventures told through the lyrics. The musical vibes range from acoustic and melodic parts to darker, heavy metal anthems. Once again on this new album, TRICK OR TREAT had the honor to work with great international guest musicians and friends like Tony Kakko from SONATA ARCTICA, Sara Squadrani from ANCIENT BARDS and, in the role of the evil general Woundwort, Tim "Ripper" Owen (ex-JUDAS PRIEST, ex-YNGWIE MALMSTEEN). "After a long time spent on the production of the new album, we can finally confirm the official release date and the last guest singer. In addition to our friends Sara Squadrani and Tim Ripper Owens, we're so happy and proud to have our friend Tony Kakko on i<>Rabbit's Hill Pt. 2 is an incredible honor for us! These guests did an amazing job, helping us to capture the perfect atmosphere of the concept taken from Richard Adam's novel Watership Down. We are so happy about the final result of our new album and we are excited about the new partnership with Frontiers, one of the most important rock labels in the world! This is really a great moment for TRICK OR TREAT! So don't miss the new album!!" "Inle' (The Black Rabbit Of Death)"